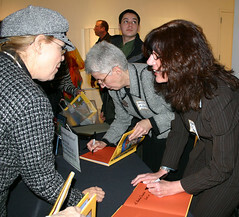 Bernice Steinhardt and Helene McQuade sign copies of "Memories of Survival" at the opening of “Through the Eye of the Needle: The Fabric Art of Esther Nisenthal Krinitz,” Feb. 26 at the Birmingham Museum of Art. The fabric panels on display depict the experiences of their mother, who hid from the Nazis during the Holocaust. An exhibit on children's art from Terezin will open at the Birmingham Civil Rights Institute on March 7. A three-month slate of Holocaust education events gets underway in Birmingham, with an unprecedented collaboration of the Birmingham Museum of Arts, Civil Rights Institute and Jewish organizations. The events center on two exhibits opening at the museum and the Civil Rights Institute. Numerous other events are scheduled around the exhibits, culminating in an interfaith trip to Prague and Israel. All events are free and open to the public, except the Klezmatics concert on March 18, for which tickets are on sale. On Feb. 26, "Through the Eye of the Needle: The Fabric Art of Esther Nisenthal Krinitz" opened at the museum. Krinitz's two daughters and their spouses, and four grandchildren attended the opening reception, where Birmingham Hadassah made a presentation about Youth Aliyah. A trunk show by Israeli jewelry artist Ayala Bar followed. Krinitz and her sister Mania were the only ones in their family to survive the Holocaust. In October 1942, her Polish village had been under German occupation for three years. That month, the Jews in Mniszek were ordered to report to the train station. At the age of 15, Krinitz decided not to go. Taking her 13-year-old sister, she looked for work among Polish farmers, and never saw her family again. After unsuccessfully finding shelter, the sisters took on new names, pretended to be Catholic farm girls and were taken in by a farmer. They worked there for two years, then the Russians came through and she saw the death camps for the first time. The sisters wound up at a Displaced Persons camp in Germany, where Esther met and married Max Krinitz. They immigrated to the United States in 1949. In 1977, Krinitz began creating fabric art to tell her Holocaust survival story. A dressmaker but not an artist, she created 36 folk-art panels to tell the narrative, from happy memories in Mniszek to scenes of "giant cabbages growing on human ashes" at the Majdanek concentration camp. Krinitz died in 2001, but her memories live on through the Art and Remembrance project, founded in 2003 by daughters Bernice Steinhardt and Helene McQuade. The project works to promote those who have told of their struggles through art, promoting peace and social justice. Steinhardt published "Memories of Survival," a book reproducing the panels and relating Krinitz's story. It was selected by the New York Public Library as one of the 100 Best Books of 2005. A short film interviewing Krinitz was produced by acclaimed director Lawrence Kasdan, and was screened at the exhibit opening. From 2003 to August 2005, the panels were exhibited at the American Visionary Art Museum in Baltimore. It comes to Birmingham after display in the Lisa Watson Children's Museum in Miami. The exhibit will be at the Birmingham Museum of Art through April 30. On March 7, "The Children’s Story: Children's Drawings from Terezin 1943-1944" opens at the Civil Rights Institute. Peter Black, senior historian at the United States Holocaust Memorial Museum, will be the featured speaker. He will also lead docent training sessions on March 6, and Allen said volunteer docents are still needed for the exhibits. The opening program will be held at the 16th Street Baptist Church at 6 p.m., followed by a reception at the Institute. Janet Reagan will make a presentation on behalf of the local synagogue Sisterhoods. In late 1941, the Nazis turned the former military fortress at Terezin into a transit camp where Jews were to be gathered on the way to extermination camps. Their goal was also to create a "model ghetto" for propaganda purposes. At its height, 60,000 were in a camp that originally housed 3,000 soldiers. About 15,000 children under the age of 15 passed through the camp, and fewer than 100 survived. While in the camp, the Jewish self-government that formed decided to try and shelter the children as much as possible, setting up schools that published children’s journals. The students were able to learn from some of the leading scholars and artists of the age, who were also imprisoned in the camp. Friedl Dicker-Brandeis, a Bauhaus graduate, set up drawing lessons, teaching the children to use art for self-expression. About 4500 of their works, left in two suitcases when Dicker-Brandeis was deported to Auschwitz in late 1944, are now in the collection of the Jewish Museum in Prague. A selection of the works will be displayed at the Odessa Woolfolk Gallery at the institute, from March 7 to April 30. The Birmingham Public Library will focus on Holocaust education during its March Brown Bag Lunch series. Held every Wednesday at noon in the Linn Henley building, the schedule begins on March 1 with Jerry Rosenberg of Tuscaloosa presenting "The Holocaust: Remembrance and Reflection." On March 8, Donald Berry presents "Lessons in Courage: Holocaust Rescuers." Cantor Daniel Gale, Lester Seigel and Jane Seigel present the March 15 program, "Music from the Holocaust." On March 22, Max Steinmetz will present "A Holocaust Survivor Speaks." The March 29 program is yet to be announced. On March 12, the Museum will host "Sounds of Faith," featuring Cantor Jessica Roskin of Birmingham's Temple Emanu-El, whose mother was hidden in Holland during the Holocaust by a Righteous Gentile. The Birmingham Jewish Community Chorale will also perform at the 2:30 p.m. program. On March 14 at the Museum, local Holocaust survivor Max Herzel will speak at a noon ArtBreak program about how art documents the Holocaust. There will be a film series at the Museum, starting with "Hiding and Seeking" on March 9 at 7 p.m. The film examines the Holocaust’s effect on faith through an intergenerational story of Holocaust survivors. On April 23, the Museum presents "Paper Clips," a documentary about a rural Tennessee school where there is no Jewish community, where the students embarked on a project to collect six million paper clips to honor each of the Holocaust victims. After receiving international publicity, the Whitwell High School students far exceeded their goal, and the paper clips are now on display in an authentic German boxcar from the World War II era. Allen said that on April 2, a busload of students from the school, led by principal Linda Hooper, will visit Birmingham. The 12th graders on the trip are part of the original class that began the Paper Clips project. The students are scheduled to meet with local Jewish high school students at Temple Emanu-El, followed by a tour of both exhibits. They will attend that afternoon's program and reception at the 16th Street Baptist Church. At the 3 p.m. program, David Gewirtzman, a Holocaust survivor, and Eugene Mukeshimana, a survivor of the 1994 Rwanda genocide, will talk about their stories and the world's reaction to what was happening during those times. On March 18, the Klezmatics, a Klezmer band from New York, will perform at the Alys Stephens Center at 8 p.m.
On March 30, Stephen Brickman, Sol Kimerling and Horace Huntley will examine "Laws of Discrimination," comparing the Nuremberg Laws and Jim Crow, and detailing their effect on daily life. The program will be at the Institute at 6 p.m.
On April 6, Amy Walsh, former head of Provenance Research at the Los Angeles County Museum of Art, will speak about her research in U.S. and foreign archives into works of art that were owned by Jewish families but then confiscated by the Nazis. Many works have made their way into museums around the world, and in some cases, survivors have fought to have the works returned. She will speak at the Museum at 6:30 p.m.
On April 17 at 7 p.m., "The Pianist" will be screened at the Norton Theatre at Birmingham-Southern College. Birmingham-Southern will also be the venue for the annual Birmingham community Holocaust commemoration, April 25 at 7 p.m. Deborah Lipstadt, Dorot Professor of Modern Jewish and Holocaust Studies at Emory University in Atlanta, will be the guest speaker. In 1993, Lipstadt published "Denying the Holocaust: The Growing Assault on Truth and Memory," the first major work on Holocaust denial. One of the named deniers, David Irving, sued when the British version was published, leading to a famous trial in Britain where, under that country's libel laws, Lipstadt had to prove the validity of her claims. The judge not only ruled that she had done so, but called Irving "an active Holocaust denier… anti-Semitic and racist." As this issue went to press, an Austrian court found Irving guilty of Holocaust denial and was sentenced to three years in prison. Lipstadt will speak about her new book, "History on Trial: My Day in Court with David Irving." The slate of events will conclude with an interfaith trip to Prague and Israel, from May 7 to 18. While there have been several interfaith trips from Birmingham to Israel in the past, this one includes visits to sites around Prague. The three-day Prague portion of the trip includes visits to the Old Town Square, the Jewish Quarter, the Jewish Museum, Prague Castle, St. Vitus Cathedral and the Terezin concentration camp. William Cabaniss and his wife, Catherine, who are from Birmingham, are planning a reception at the residence of the American Ambassador to the Czech Republic for mission members. There are a few spaces left on the trip, and the cost is $4262 per person. Allen said the steering committee has been working on these events for the last 14 months. "Through our programming, we hope to introduce students of all ages - from 8 to 108 - to some of the issues and individuals who died and who survived the Holocaust. We hope to promote further understanding of the ramifications of prejudice, racism and stereotyping." About $100,000 was raised to support the programs. Underwriters include the City of Birmingham, the Jefferson County Commission through the Jefferson County Community Arts Fund, Birmingham Jewish Federation, Judaic Studies Fund at Birmingham-Southern, Birmingham Jewish Foundation, the Frank and Fred Friedman Family Foundation, Ronne and Donald Hess Foundation, Schaeffer Eye Center, Mayer Electric Supply Company and Patsy and Charles Collat, Jim and Louise Abroms, Pizitz Management Group, Deep South Jewish Voice, Marvin and Ruth Engel, Carole M. Pizitz, Betty Goldstein, Carol and Jimmy Filler, and the Birmingham chapter of the Zionist Organization of America. Also contributing were these funds from the Birmingham Jewish Foundation: the Fred and Sylvia Berman Fund, Karen and Leslie Allen Holocaust Education Fund, Laurie and Craig Elmets Family Education Fund, Morris and Joe Sirote Community Fund, and the Unrestricted Fund.